Places to visit: delhi – srinagar – kargil – mulbekh – dha hanu – lamayuru - tingmosgang – rizong – alchi - likir – basgo – nimmu – leh - sumoor – diskit - leh – spituk – phyang - shey – thiksey – stok – matho – stakna – hemis - keylong – manali - nalagarh – kalka - delhi. The journey starts from Manali driving through the lush green and foggy Rohtang Pass (3980 m. The landscape surprisingly changes into the rugged brown of the rain shadow area of Lahaul. The landscape changes into naked desert after crossing a few villages of Lahul with prayer flags on their roofs. You will start ascending Baralacha Pass and you can see surprisingly sprawling plain areas of Serhcu where you will spend a night in tented Camp. Further, there many small passes before you cross Taklang La pass Taglangla at 5330m to reach Rumtse and Gya village. An hour drive from Runtse takes you to Upshi where you corss indus river enter Indus valley with dotted villages on it's bank and beautiful monasteries bulit on hill side. You journey finishes at Leh making it a drive of lifetime's experience. The Pangong Lake is 160 km from Leh, with spectacular view colorful mountains and Changla pass. 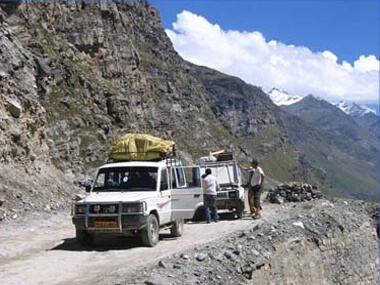 The scenic view of colourful mountains throughout the journey makes your trip memorable. The drive begins with photogenic view of Thiksey monastery, famous for its architectural similarities with Potala palace of Lhasa. The monastery covers an entire mountain ridge. Beyond this village, you will drive towards Changla pass, leaving the Leh Manali road on your right hand side. The long easy ascent to takes you to Changla pass through its winding roads passing through Sakti Village. Stop at the Changla Pass for a quick photograp and drive down to the village of Tangtse, where you can enjoy a cup of tea. Laeaving Tangtse for Pangong you pass through many small villages of Changthang and finally you can have sudden view of the lake. The Pangong Lake is dramatic, surrounded by colorful mountains and it's reflection makes the lake beautiful. The color of the lake changes into different color throughout the day. The division of lake between India and China makes it different than the other Lake. Therefore you are allowed to go upto Spangmik only. Assistance at the airport and transfer to hotel. Ost breakfast transfer to the domestic airport to board the flight srinagar . Arrive srinagar transfer to house boat dal lake / nagin lake . O/n house boat. Post breakfast visit the mogul gardens & sankracharya temple . Post lunch, shikara ride on the dal lake to enjoy the beauty that god has graced this city with which is often compared to venice . O/n at houseboat. Post breakfast drive to kargil. 204 kms (7 – 8 hrs). The road passes through the panoramic village of sonmarg (2740 mtrs) after sonmarg most of the road is rough and wet. Cross zojila pass 3527 mts (gateway of ladakh) and continue drive towards drass (the second coldest inhibited place in the world). Arrive kargil (2710 mtrs) which has got its importance after opening of ladakh for tourists in 1974. O/n hotel kargil. 05 Kargil – Mulbekh – Dha ( land of aryans ). Post breakfast drive to dha enroute visit mulbekh, o/n camp / local guest house dha. 06 Dha – Lamayuru - Tingmosgang – Rizong - Alchi. Post breakfast drive to alchi enroute visit lamayuru monastery, tingmosgang village and rizong monastery. O/n hotel in alchi. 07 Alchi – Likir – Basgo – Nimmu – Leh. Post breakfast drive to leh enroute visit likir monastery, basgo monastery. O/n hotel in leh. Day at leisure. O/n hotel in leh. 09 Leh – Sumoor. 120 kms. Leave early morning for khalsar over the khardongla pass at 18380 ft. ( highest motorable road of the world) arrive khalsar which is the second village of nubra while going from leh. Further drive to sumoor village. Post lunch visit sumoor monatery (samstanling) & panamik village . O/n deluxe camp. 10 Sumoor – Diskit - Leh. Drive to diskit. Visit diskit monastery and the town, which is the headquarter of nubra valley . Post lunch visit hunder village last point for the tourist also visit the hunder monastery and drive back to leh. O/n hotel in leh. 11 Leh – Spituk – Phyang - Shey – Thiksey – Leh. Post breakfast visit shey, thiksey, spituk & phyang monasteries. O/n hotel in leh. 12 Leh – Stok – Matho – Stakna - Hemis. Post breakfast visit stok, matho, stakna & hemis monastery. O/n hemis in camp / local guest house. Post early breakfast drive to keylong via taklang la (5360 mts) pass. 340 kms (8 - 9 hrs). O/n hotel in keylong. 115 kms (4 – 5 hrs). Manali sightseeing, visit naggar village, naggar castle and roerich art gallery . O/n hotel in manali. 261 kms (7 – 8 hrs). O/n nalagarh fort. 16 Nalagarh – Kalka - Delhi. Drive to kalka 40 kms. (01 – 02 hrs). Drive to kalka to board the train to delhi . O/n hotel in delhi. Post breakfast half day delhi sightseeing, post dinner transfer to the intl airport to board the onward flight.